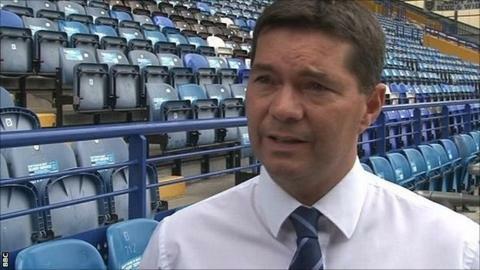 Portsmouth chief executive Mark Catlin says there is significantly more interest in the managerial position at Fratton Park, compared to their last search for a new boss in 2013. The club have received applications from managers in higher leagues. However, Catlin confirmed they may wait until the end of May to appoint a replacement for Andy Awford. "Personally I think it would be worth waiting a few weeks to get the right man," he told BBC Radio Solent. "It's difficult to put a timeline on it as there are people on the list that may be currently employed and who have jobs to finish off at their current club. "It could end up waiting until the end of May. I know that's not ideal, but what we don't want to do is take someone now just because they are available, so we might have to wait another six weeks." Catlin says applications from serious candidates were presented to the board over the weekend and each individual member will now draw up their own shortlist of six or seven contenders. Following that process, an overall shortlist will be produced. Awford, who was sacked earlier this month, came from within the club's existing staff and the last time the board looked elsewhere for a new manager was when Richie Barker was appointed in December 2013. And Catlin, who was speaking at the launch of a new deal with main sponsor Jobsite, has been encouraged by the level of interest this time. "Compared to 2013 it's significantly higher than last time around," he said. "Credit to what everyone has done, it's now seen as a stable club. Agents and managers talk and they know the budget we are able to deliver, they know we've got our own training ground and they know this club is literally waiting to take off. Meanwhile, Steve Tovey has resigned from the board of the Pompey Supporters' Trust with immediate effect, having originally been due to step down this summer. Tovey quit his position as treasurer earlier this year and was replaced by Geoff Paul earlier this month.